DES MOINES, Iowa (AP) — Financial aid and global coordination are needed to prevent the Ebola health care crisis from becoming a food emergency, agriculture ministers from West African nations at the center of the Ebola outbreak said Thursday. In Sierra Leone, where thousands are infected and more than 900 have died, 40 percent of the farmers have abandoned their fields, said Joseph Sam Sesay, minister of agriculture, forestry and food security. Coffee and cocoa beans amount to about 90 percent of the country’s agricultural exports, and the region where they are grown has been struck hard by the virus. Sierra Leone’s economy was expected to grow more than 11 percent this year until Ebola struck in May. Now growth is only predicted to be around 3 percent, he said. 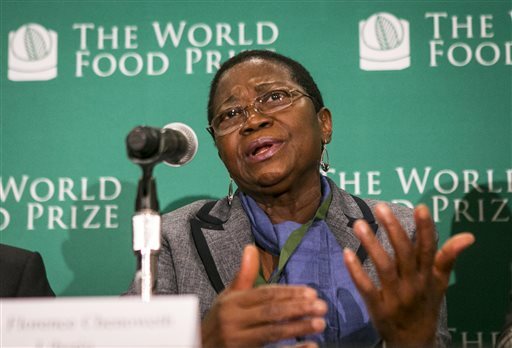 Liberia Agriculture Minister Florence Chenoweth says billions of dollars of outside agricultural investment is gone because farming has been decimated. Liberia expected 9 percent economic growth but has ratcheted it down twice to about 2 percent, Chenoweth said. The nation had attracted $17.6 billion of foreign investment of which $7 was for agricultural development but those investors have left, she said, adding that a recovery plan has been developed. International food and medical assistance is needed to stem the spread of Ebola, he said. The officials spoke Wednesday at the World Food Prize Foundation annual meeting in Des Moines where government, academic, corporate, nonprofit agriculture and food experts gather to discuss issues of hunger and boosting agricultural productivity.